QuoteSearcher Competition: Win a Dual Power Bank! Home Blog QuoteSearcher Competition: Win a Dual Power Bank! These days most people can’t live without their mobile phones, tablets and laptops, however it always seems like these gadgets run out of power at the worst possible times – but not anymore! By entering QuoteSearcher’s Twitter competition you can win a thumbsUp! Dual Power Bank which can quickly charge your mobile, laptop, tablet or any other device for that matter! This device is perfect for anyone who is always on the go, including businessmen, mobile tradesmen, and, of course, motor traders! 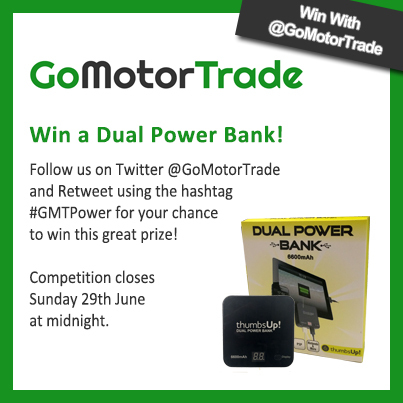 For your chance to win this amazing prize just follow us on Twitter @QuoteSearcher and Retweet using the hashtag #GMTPower.